When I stop at a service station with my BMW K100RS, kids often ask me the same question I asked as a child: "How fast?" I usually just smile. When I was offered the G5, I jumped at the opportunity, although I knew I would not be able to run any objective test of the machine. By coincidence, as I left my office to collect the computer, the latest issue of MacWorld was in my mailbox and that carried comparisons between G5s (plural) and other machines. If you want to look at the tests and the graphs that the Macworld testers procduce, they are still available. The dual-processor G5 is (at the moment) the fastest. What I wanted to do was to take a more subjective approach and see what it was like to run a G5 alongside my usual hardware. As a note, particularly in the light of recent legal moves in the US, System Profiler reports two sizes for the hard disk (this is the same for the iMac). If you measure 1KB as 1024 bytes, it is 149GB; but if you use 1000 bytes for 1K, it is 161GB. Using iMovie as one basis for comparison I imported the same four photographs. While the rendering that occurs took a little under 2 minutes on the G5, the iMac plodded along for 12 minutes. While waiting, my assistant added effects, and transitions then rendered the whole file again before the iMac had finished the first stage. This indicates both an ability to handle much larger quantities of data and a massive increase in efficiency. A QuickTime clip of 1.4 MB took about 2.5 minutes to import into iMovie while the same clip on the G3 iMac was still struggling long after the G5 had finished. The final time was 9 minutes. Another clip, with a time of just under 10 minutes and a size of 2.3 MB was imported in 4 minutes with the G5. The iMac failed to finish the task twice, and after about 10 minutes, the reported time to completion increased to over 30 minutes. Importing photographs with iPhoto was similarly faster. I shot a test group of 10 images with a resolution of 3 megapixels -- a normal size for amateur pictures -- and imported these. From plugging the camera into the USB port to iPhoto startup took 22 seconds with the iMac and 6 secs with the G5. The import of the images was 60 and 38 secs respectively; and conversion of the images to web-pages, with thumbnails and full size pictures, was finished in 35 and 9 secs. This proves little except that a faster chip, plus more memory and more computing muscle, is faster. However -- and here I am stating the obvious -- if you look at this in terms of productivity (or economics), while you are waiting for the iMac to complete its task, if you had been using the G5, it would have been completed long before. It is said that "Time is money" and the current market for the G5 is those who need high productivity and for whom, Time really is a high-cost commodity. Interestingly, while the processing was taking place, the fans on the G5 were slightly noticeable. Not that they were obtrusive, but that sitting there waiting for the iMac I was making myself aware of what was happening on the two machines. At no time during the days that I had the G5 was there any sense that it was over-heating. The case of the iMac is often hot to the touch, and a desk fan is used to cool things off. Opening any application on the G5 was swifter, even when the software was installed on the iMac and I was using an Ethernet link to access it: and even when the program was already open on the G5. I had thought that this would not be possible, but it was nice to be proved wrong. We almost ended with a dilemma. As much as I like the G5 and its Cinema Display -- who would not? -- I am comfortable working at home with the iMac. It has been an excellent home-office computer: word-processing; some minor spreadsheet work, for student marks, some graphics capacity for web development and a machine to link to the Internet. 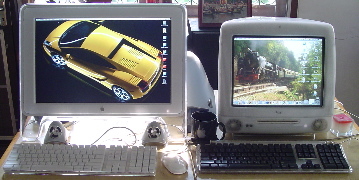 I could certainly go for a G5 eMac, if Apple ever makes one. And then I installed a demo of a new game, "Warrior Kings". This is a game from Feral in the UK and well worth having a look at, especially if you liked the earlier "Black and White". The ability to run such a game with its high quality graphics and 3D effects, was quite astonishing. Here, the iMac is certainly out of its depth. This game tipped the balance. While I could continue with my regular work on the iMac, the G5 -- remember the high-quality of movie displays too -- is not simply a fast computer, but with its DVD and iTunes capabilities it also qualifies as a high-end home entertainment centre. At work, it is different. A computer for an office needs to be not more robust, but to have more computing capacity -- and certainly have more memory. Our G4s are used with multiple user accounts and (like the iMac) are set-up for use as web-servers and for QuickTime streaming. The G5 does all of this too and, in one way, may be seen as part of a natural evolution (compare what is available now to what was on sale when the Bangkok Post Database was first published). I would order a dozen today, if I thought there was any chance of them being put on the budget. Modestly, I have asked for two; but I am not a gambling man. Note: Between the time the first article was printed and this one, Apple revised the G5 range. The 1.8 GHz PowerPC reviewed here was replaced with a 1.8GHz dual-processor computer. The 2 GHz machine is also available along with a 1.6GHz single processor G5. 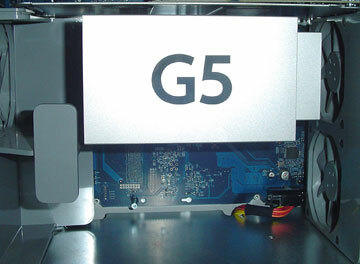 See also Part 1, G5 PowerPC: Minimalist by Design.